With prices creeping upward and the central bank looking to take monetary action to fight inflation, the government has suspended the publication of the monthly Consumer Price Index, an official at the Ministry of Plan­ning said yesterday. Sam Sarouen, deputy director of the statistics department in the Ministry of Planning, said that the Ministry of Finance had requested his ministry not publish the CPI report, which details June’s inflation rate. An official at the Ministry of Finance, however, said he was un­aware of any suspension of statistics on consumer prices. “The Ministry of Economy and Finance do not allow [us] to publish,” Mr Sarouen said yesterday, adding that he did not know the exact reasons for the report being withheld. The delay in releasing the CPI figures comes as prices are rising —the most recent figures show year-on-year inflation at 6.5 percent in May—and as the US dollar re­mains weak, imports to Cambo­dia become more expensive. It is not the first time that inflation data has been suspended. In 2008, at the height of the global food crisis—a period when the cost of food surged in Cam­bodia—the Ministry of Plan­ning suspended the monthly publication of the CPI. The ministry stopped publishing the report in March, 2008 after it showed an inflation rate of 18.7 percent from January 2007 to January 2008. Immediately after the release of the March figures, officials claimed the statistics were inaccurate and the method used to calculate them incorrect. Economists at the time disagreed, saying the CPI was a true reflection of price increases in the country. In September that year the government eventually revealed what it called a record high year-on-year inflation rate of 22 percent for July. Sim Ly, deputy director of the department of national accounts in the Ministry of Planning, gave a different reason for the delay in publishing the index, placing the blame on technical problems. “We cannot publish because the [computer] server doesn’t work,” he said when asked why the government’s June inflation report had not been released. The Ministry of Planning usually publishes the CPI for the previous month in the third or fourth week of each month. 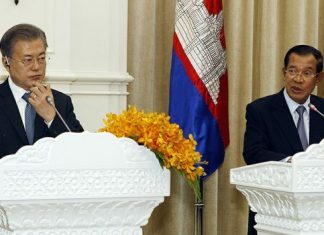 Hang Chuon Naron, secretary of state at the Ministry of Finance, denied that there was any delay in reporting the inflation figures, saying that the government does not normally publish information on inflation. “Usually it is not published,” he said, declining to comment further. In May, the last month for which data on consumer prices is available, the year-on-year inflation rate was recorded at 6.5 percent, a 14-month high. Rising food prices in items such as meat, fish and vegetables are the main cause for the rise. Though steady increases in fuel, electricity, clothing as well as goods and services have also contributed. Since the beginning of the year, officials and economists alike have been warning of the risks associated with rising inflation. While inflation rates in countries such as Vietnam, China and Indonesia have all been rising. The annual inflation rate in Vietnam reached 22 percent in the first seven month of the year mainly due to rising food prices. Vietnam has already devaluated its currency, the Dong, several times in order to fight against inflation. 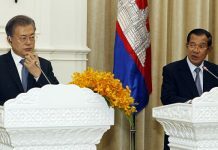 Cambodia is also looking into taking measures to help reduce inflation. The National Bank of Cambodia announced last week that is would increase the reserve rate for banks from 12 percent to something in the range of 16 percent. The idea is to make banks hold more capital at the central bank and, thus, reduce liquidity in the economy. Economists say that inflation data is essential when assessing Cambodia’s macroeconomic indicators. 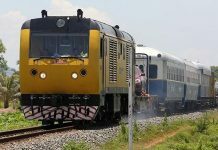 “Of course, this kind of fundamental data is very important especially in Cambodia where it is very difficult to get the monthly statistics,” said Suzuki Hiroshi, chief economist of the Business Research Institute of Cambodia. Mr Suzuki added that he had not expected the inflation rate to be so high in May.